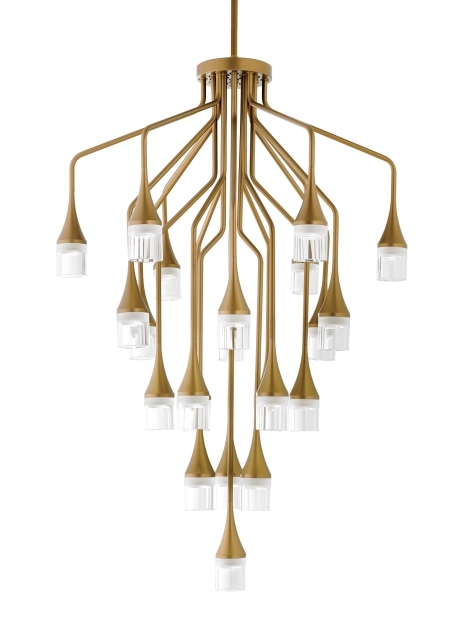 The Patrona Suspension light by Tech Lighting is sophisticated and undeniably beautiful. With twenty-two precisely executed metal stems each bear a sleek crystal shade illuminated by a gently diffused LED. The stems from tiers which taper at varying angels, and lengths, create a stunning modern interpretation of the classic crystal chandelier. The Patrona is available in two striking finishes, Satin Gold and Satin Nickel and ships with energy efficient fully dimmable LED lamping. This grand scale suspension is ideal for dining room lighting, foyer lighting and a conference room lighting, no matter the space the Patrona will add a touch of sophistication and beauty. Includes (22) 3 watt, 3000K LED modules (66 total watts, 2950 total delivered lumens). Fixture provided with 36 inches of variable rigid stems (includes one 12 inch & two 24 inch stems) in coordinating finish. Dimmable with most LED compatible ELV and TRIAC dimmers. Available with hang straight pivot to help correct minor ceiling imperfections.